This annual report is also quite late -- efforts to expand non-technical capacity of the foundation in order to handle things like annual reports have been quite a challenge, sadly. 2015 was another quite challenging year for MetaBrainz. We spent quite a lot of time reactively fixing troublesome infrastructure and dealing with ongoing team issues that spilled over into community conflicts. However, we finished the year having accomplished a number of important tasks that allowed us to finally break out of an established pattern that was limiting the organization. We started the year discussing how to deal with troublesome editors in our community, realizing that our community wasn’t as healthy as we would like it to be. Reosarevok, our newly minted style BDFL was working down a backlog of style issue and writing nice blog posts summarizing his work. In February of 2015 Rassami Hok Ljungberg joined our board of directors to expand the reach of our board into the European music industry. In March we kicked off our rebranding efforts brought on by an increasing number of projects that required new logos and the fact that our existing logos were of poor quality and ancient. It was also at this time that we started having increased problems with our servers, starting with our database server. We appealed to the greater Postgres community for help with our problems and soon after resolved our problems. In April we gave a terse rebranding effort update that demonstrated our current thinking and showed off some first results; this process continued for a number of months. During this time the MusicBrainz team was also working hard on the next schema change release, which would make one small change that would have a significant impact on us later. From that schema change release we would reserve the Live Data Feed updates to registered users only. This gave us more control over who had access to our most valuable data asset. In May we released a new MetaBrainz web site, complete with the new logo for the Foundation. This goal of this new web site was to improve our professional appearance and to make it clear that we are a professional organization. This was the critical moment for us that would help lift us out of our resource constrained rut we’d been in for several years. We needed to change our approach to business -- previously we licensed data on the basis of the Creative Commons licenses, but that stagnated our income for several years and it was clear that change was needed. The new MetaBrainz site allows organizations to sign up for commercial support under different tiers: Bronze, Silver, Gold and Unicorn -- Unicorn is meant for large companies and mythical situations. (We also had a mobile tier, but phased that out in 2016.) The important change here was that we were asking all companies who make commercial use of our data to support us -- regardless of what licenses we use for our data. This proved to be a tricky thing to implement, but has served us quite well so far. It was around this time that more team drama unfolded behind the scenes. Keen observers of the foundation could notice this: our blog was nearly devoid of any meaningful updates during this phase. The pinnacle of the conflict came when a core developer and some core contributors left the team/community. Shortly after this we started the long process to repair the community and to move forward from the drama. The most important step in this was the creation of a community manager position and then hiring Freso to take on that job. Over the summer we focused on getting back to work, moving projects forward quite a bit. In September we hired Roman Tsukanov who had just moved to Barcelona. We also decided to forgo the autumn schema change since we still had a lot of leftover work from the spring schema change. We closed out September with hiring Laurent Monin (zas) as our system administrator, since managing the servers became too great a shared burden. At the end of October we held a small MusicBrainz summit at Robert’s house in Barcelona. Closing out the year we were accepted to Google’s Code-In program, battling with search server crashes and finally hiring Christina Smith to help with the business side of the foundation. Our year started off with a lot of conflict, but ended up with a stronger team, new logos and a new MetaBrainz site that immediately saw increased revenues for the foundation. Not a bad close for a stressful and trying year! 2015 was generally pretty quiet on the business front, since we were working on improving our presence on the internet. We did however, make some nomenclature changes to reflect our changing business attitude/appearance. One of those was dropping the use of the term Customer and instead using the term Supporter. In June we signed Universal Music, the first major record label as a supporter to the Foundation. We also signed Next Big Sound, which of course become part of Pandora in the same year. We also signed a number of smaller organizations as a result of our new web site. For a complete list of current supporters, see the MetaBrainz Supporters page. Our traffic can be broadly described as being steady over the course of 2014. We would routinely get 20M requests per day and we were able to honor about 16M of those requests. The remainder of the requests we could not honor (and resulted in a 503 error) due to bandwidth and hosting capacity limitations. As the year closed we had a sharp uptick in traffic that caused our servers to overload -- at that point in time it was unclear where that traffic was coming from and we had no means to really analyze our situation. As 2015 closed, we started making concrete plans to find a new hosting provider and what it would entail to move our services. In 2015 we were not quite as financially constricted as in 2014, and things were slow improving over the course of the year. Income continued steadily and we didn’t suffer any financial bottlenecks. In actual dollars, not considering the depreciation of our servers, we were in the black. But, when considering the depreciation of these servers, we actually ended up the year in the red. In the course of 2015 we spent $2,037.82 on hardware and $26,422.06 on hosting costs for a total of $28,459.88. This compares to $21,787.15 in 2014, which means that our costs of operating the service were a little higher in 2015. Part of this increase was that we were required to purchase two new gateway servers to replace the failing carl/lenny gateway servers. We had hoped to not buy new servers, but we could not avoid this before moving hosting providers. We’re still not able to compute the cost per 1M web or web service requests until we get our traffic stats system running again. In the past this had been our metric to measure the efficiency of our organization. In 2015 we spent $81,378.25 in salaries for developers, $1,891.20 for community management, $9,496.00 for customer support and our costs for administration was $79,499.92. Given that we’ve changed our business model in the middle of 2015, we have income from both the old categories (Live Data Feed, CC data) and the new categories (Bronze, Silver, etc), which creates a muddled picture. Simply put, we earned $146,130.00 from licensing our data and support payments combined. This is down from $177,210.00 in 2014, partially because the BBC paid for 3 years in advance in 2014 and we didn’t receive any money from them in 2015. Also Universal Music’s first annual payment wasn’t received in 2015. While the raw numbers do not reflect this, it means that our data license/support income was slightly higher than in 2014 with promises of improving in 2016. Our end user donations via PayPal came to $7,985.93, which is up 32% from 2014 -- while this is good, it still isn’t as good as 2011/2012 when we had donations of more than $14,000. Direct/large donations added up to $41,915.84, including $40,000 annual support from Google’s Open Source Programs Office and some cash donations from smaller donors. Spotify and Google additionally both donated $3,000 to our annual summit. In 2015, 21,004 editors made a total of 5,744,322 edits. The total number of active editors is up from 19,397 in 2014, and the total number of edits has increased by 510,093 edits. In 2015 we received 1,505,566 edit votes, which is up 269,571 votes from 2014. These votes came from 1,198 editors, up from 1,187 editors in 2014. Note: All of the statistics may include editors whose accounts have been deleted in the course of the year. dib: Network router, takes up a slot, but only visible from the back. In 2015 we saw our trusty catch-all server Scooby die after a decade of reliable service with us. And before Scooby reached us, he had another life for a couple of years with another company. What a remarkable server! Hobbes (Mac mini, tucked away in the back), continuous integration (jenkins). 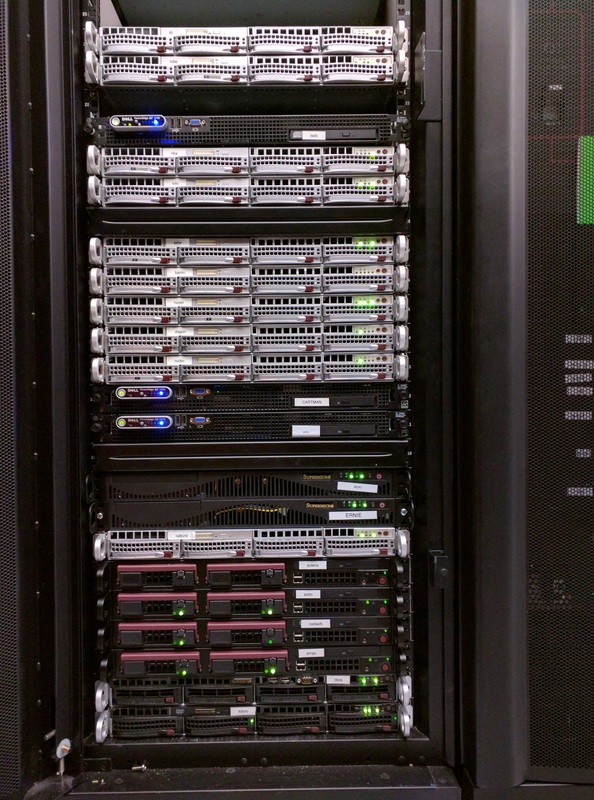 Spike (server at Hetzner in germany), running AcousticBrainz. MusicBrainz used 30Mbps of bandwidth per second on average and drew 34 Amps of current for a power consumption of about 3,740 Watts. MusicBrainz physically occupied 24 Us of space (half of a rack, with some empty slots) at Digital West in San Luis Obispo, CA. Many thanks to our editors, voters, peer reviewers, bug watchers and other members of our community -- without you MusicBrainz would not be what it is today! We'd like to also thank our developers that pushed out dozens of releases of the site, Picard, client libraries, AcousticBrainz and the Cover Art Archive. All of your work is critical to enabling the MetaBrainz community to do its job. We'd also like to thank our awesome Board of Directors and all of the donors who contributed money and all of our supporters. Thanks also go out to Niclas Ljungberg who contributed the branding brief and to Nicolas from MonkeyDo.digital for his work on our stunning logos. In particular we'd like to thank Google for its annual support, and particularly Google and Spotify for their support of our summit. These large contributions/payments allow us to carry on with our mission of making MusicBrainz the most comprehensive music encyclopedia out there! Thank you to everyone who contributed in 2015!